This is a classic Vuelta a España stage in Asturias. 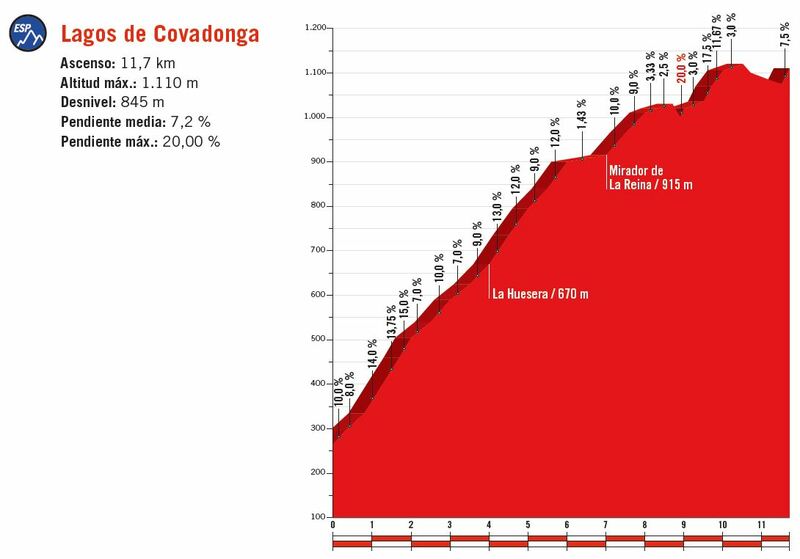 The finish on Lagos de Covadonga is a mythical one and the ascent always provides great entertainment. From the start, only the first 10 km are flat. Afterwards, it’s pretty much up and down for the remaining part of the stage. Most likely, the right group will get away on the 6 km of 4.7 % towards the top of Alto de Santa Emiliano. From here on, the riders head northeast towards the feed-zone in Colunga. Soon after, they start on a loop around the challenging ascent Mirador del Fito (7 km / 7.7 % avg. ), which they take on twice before continuing towards the final climb of the day. The road starts to kick up already at the intermediate sprint in Cangas de Onís. However, it’s not until 10 km later that the official ascent to Lagos de Covadonga begins. These final 11.7 km kick up with an average gradient of 7.2 % and include numerous parts of double-digits gradients. While the first 6 km are steady with percentages around 8-12 %, the second part of the climb is much more rhythm breaking. There are a couple of sections of false flat, which are followed by steep ramps of up to 20 %. As the riders reach the lakes at the top of the climb and the final kilometer, they take on a fast but short decent before the last few hundred meters are uphill towards the finishing line. The road-book shows a total elevation gain of 3940 meters today. However, the actual amount of climbing is over 4500 meters. After so many hard days in a row, the riders will welcome tomorrow’s rest day with open arms. If the GC riders are to fight for the stage win again today, much depends on what Movistar will do. If they decide to make the race hard and put pressure on the their rivals already on the penultimate climb, the gap to the break will decrease rapidly. If so, Nairo Quintana will be in a prime position to do what he did two years ago when he soloed away to victory. This climb suits the Colombian much better than the short and steep ones we have seen the last two days. He has proved to be in great condition and I’m sure he will do whatever he can do take back time as soon as possible. On stage 14, Miguel Ángel López seemed to be able to follow Quintana without any problems. However, he didn’t want to work together with his fellow countryman and that cost him the chance to fight for the stage win. He’s now 47 seconds down in the GC so he too needs to gain time today. He can no longer hesitate and that should make for very interesting fight on the final climb. While Quintana and López are focused on taking back time, Simon Yates has the luxury of being in a position where he doesn’t necessarily need to attack. He’s leading the race and has already won a stage. Now, he can ride defensively and let Movistar and Astana do all the work. Then, at the end, if he’s able to follow the two Colombians, he might even take another stage win due to his fast finish. Thibaut Pinot will also be eager today. He did very well on stage 14 and since he’s not an imminent threat in the GC, he might be able to sneak away on the final kilometers if Quintana and López pay too much attention to each other once again. Often, we have seen a lone rider from an early breakaway make it all the way to win in Lagos de Covadonga. It won’t be a surprise to see the same thing happening today. If so, Rafal Majka seems like the prime pick. BORA-hansgrohe managed to set him up perfectly on stage 13 and for a while, it looked like Majka had everything under control. However, out of the blue, Oscar Rodriguez came back and – with astonishing ease – dropped the Pole and won the stage. Majka couldn’t believe what happened and he must be extremely eager to take his revenge as soon as possible. In 2014, Przemysław Niemiec won here after a long breakaway. Today, we might get yet another Polish win on this legendary climb. With 43 KOM points up for grabs, this is another important stage for the riders targeting the polka dot jersey. Thomas De Gendt is now just 10 points behind Luis Ángel Maté, while Ben King has 24 points up to the Spaniard. Bauke Mollema is 30 points down, which means he also has chance to get back in the mix with a big day on bike today. Mollema has already finished second twice in this Vuelta. On his best days, this would be a great climb for the Dutchman. If he gets into the winning break, Mollema might be able to break the spell and take a huge win. For other good breakaway candidates, look to Ilnur Zakarin, Alessandro De Marchi, Gianluca Brambilla, Mikel Bizkarra, Pierre Rolland, Alexander Geniez, Michal Kwiatkowski, Sergio Pardilla and Sepp Kuss who might be given the green light from LottoNL-Jumbo to attack if he has something left of that outstanding shape he showed in Tour of Utah and in the first week of this Vuelta. Keep the previews coming and wish cash prizes! As you may know, I’ve teamed up with the fantasy manager site Zweeler for this year’s Vuelta a España. Every day during the race, you can create a fantasy team for the stage and play to win cash prizes. The daily prize pool is at 400 Euros for this stage. The more people who sign up and create a team by clicking here, the better the chances are that the previews will continue for the final week of the race. The money made goes to cover server and maintenance costs. Without your help, most likely, this will be the last stage preview of the Vuelta. For daily live streams of all the stages in Vuelta a España 2018 go to steephill.tv.